The local version of the innovative competition created by the Department of International Trade will take place on 28 March. The UK Department of International Trade (DIT) has announced that the Argentine chapter of the successful Startup Games will take place on 28 March. This initiative by the DIT’s Global Entrepreneur Programme invites entrepreneurs to compete for virtual one-million-pound seed funding for their projects, using a specially designed app. The full-day event will bring together entrepreneurs and investors at the Residence of the British Ambassador to Argentina, Mark Kent. About fifty competitors will be selected among all those who register by 27 February to take part in the event. In addition, there will be a large number of potential investors who will attend the Startup Games by invitation. The first edition of the Games was held in London in 2012 to coincide with the London 2012 Olympics. 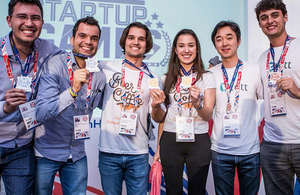 Last year it was held in Rio de Janeiro and, given the success of the event, DIT this year decided to stage the Startup Games in different cities around the world, like Singapore, Sydney, Santiago and Buenos Aires. Among the speakers who will advise participants on how to attract investments for their projects are distinguished “dealmakers” like Andrew Humphries, co-founder of the business accelerator The Bakery London, and Sheetal Walsh, who has worked with more than 250 startups and is an expert on technology business development. Officials from the National Government and the Buenos Aires City Government, as well as leading Argentine businessmen, will also take part as speakers. If you are interested and would like to find out more, please visit DIT’s website.